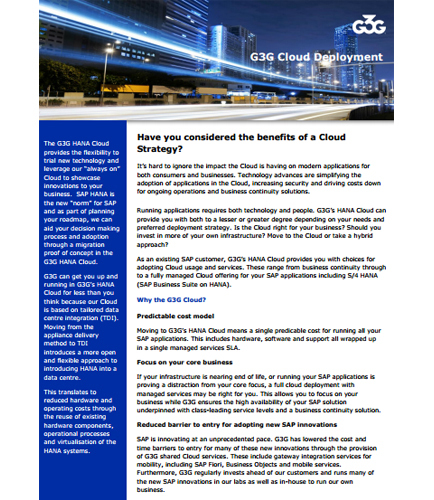 "G3G Cloud Deployment :Solution with G3G HANA Cloud services"
The G3G HANA Cloud deployment provides the flexibility to trial new technology and leverages the “always on” cloud to showcase innovations to your business. SAP HANA is the new “norm” for SAP and as part of your roadmap planning we can aid your decision making process and adoption through a migration proof of concept in the G3G HANA Cloud. Read this whitepaper that brings you different cloud deployment strategies and the benefits of the cloud deployment models and services.